In Gotham Central, Batman's supporting characters step out from the shadows... and the closet. Gotham Central is a new graphic novel series following the police force of Gotham City, as they deal with everyday disasters and supervillains. There are plenty of familiar faces from the Batman stores, but the focus is emphatically on the GCPD and the Major Crimes Unit. It was one of those comics that completely bombed, sales-wise, but soared in reviews. And of course, it provides some cop drama backstory for Renee Montoya, lesbian, and future vigilante. Gotham Central has now ended, and Renee Montoya went on to become the focus of some of the comics in 52 (a series of 52 comics -one for each week in the year! Renee's main appearance began in 52 Week Eleven ), in which she's miserable and alone - then falls in with The Question and turns vigilante... and has a few sexually tense encounters with Batwoman. Eventually, she becomes The Question herself. The first paperpack book of Gotham Central, In the Line of Duty, is three short stories, one of which focuses on Renee Montoya. In Half A Life, Renee gets outed against her will as part of a plot to frame her for murder, and gets both support, flack, advice and rejection. This is just part of a larger story involving Two Face, who fixates on Renee and the police department itself. Also available separately, Half A Life is definitely one of the best stories in the series, and the best choice for a 'lesbian coming-out mainstream comic'.The story is solid, the art is good, and we get to meet her current girlfriend, Daria (a chef!). It won a fair number of awards, too! The rest of the Gotham Central series follows the same lines, with Renee's relationship with her partner at work, and with Two Face, being central themes. However, while she's a main character, the rest of the books don't focus so much on her. At the end of the series she resigns in disgust and moves on to other graphic novels! Eisner Award - Best Serialized Story 2004 - Half a Life (Gotham Central #6-10). Harvey Award - Best Single Issue or Story 2004 - Half a Life (Gotham Central #6-10). Tied with Love & Rockets #9. 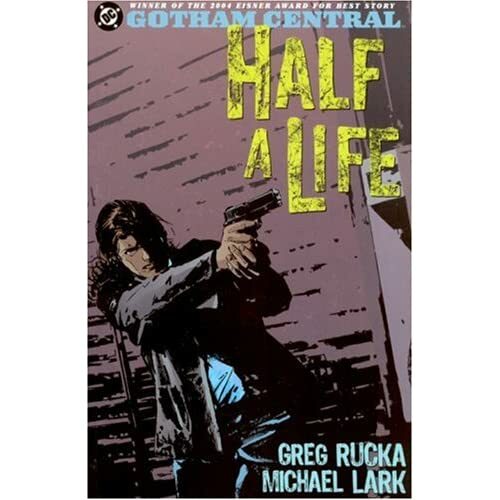 Gaylactic Spectrum Award - Best Other Work 2004 - Half a Life (Gotham Central #6-10). Tied with Angels in America. There are four collectible hardback volumes for Gotham Central. (confusingly, the first trade paperback is also called In the Line of Duty).